The melons at the farm are peaking right now and they are so damn sweet and delicious that we’ve been eating them straight off the vine in the middle of the field for a quick pick-me-up. I love serving them at happy hour sprinkled with a little chili powder, sea salt and lime juice (like my recipe here). However, they taste pretty darn wonderful in the morning filled with yogurt, granola and a drizzle of honey. This is definitely more of a method rather than a strict recipe but the only thing I will highly suggest is that you grab your melons from the farmers market or straight from a farm stand. Nothing compares to a fresh melon and because it’s the star of the show definitely source out a good one! We topped our melons with yogurt and my nut and seed granola from earlier this week. I always have papaya bowls and watermelon bowls, but never cantaloupe! Sounds delicious! Brilliant–so simple, but absolutely something I had not thought of! I actually plan on making your tahini cardamom granola soon, now I have a great use for it! I bet dukkah would be interesting too. YUM! 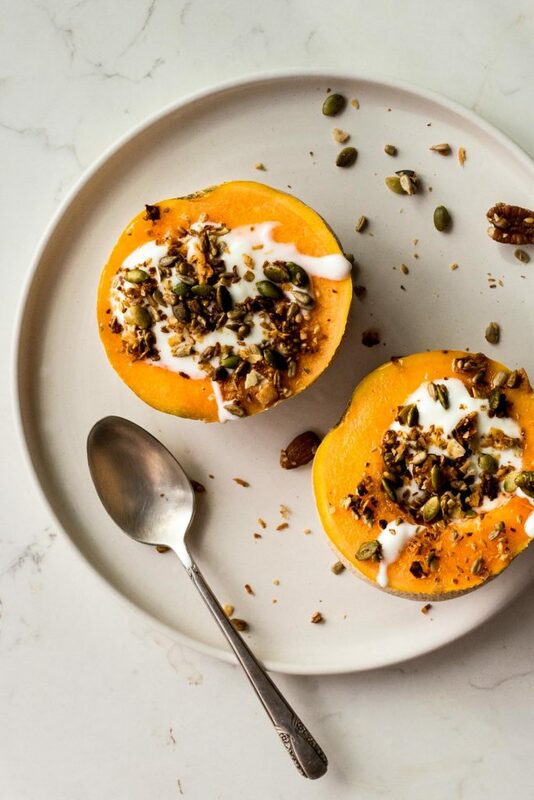 What a super yummy, easy, healthy way to start the day. Plus there’s super little prep and clean up! This is genius! When I was little my grandmother used to serve us ice cream in cantaloupe halves.